If you have a taste for the finer things in life, then this might just be the event for you. Bringing together two great gustatory experiences, Fleming’s Prime Steakhouse & Wine Bar in Rancho Cucamonga, 7905 Monet Ave., will present a Hangar 24 Beer Dinner at 6:30 p.m. on May 20. The event will be hosted by Fleming’s Wine Manager Kyle Witter and Hangar 24’s Brewmaster Kevin Wright. The four-course dinner includes beer pairings with each course. That last one alone would likely give me a food high. Seating for the event — which will cost $59 per person, excluding tax and gratuity — is limited. For reservations or additional information, call 909-463-0416. 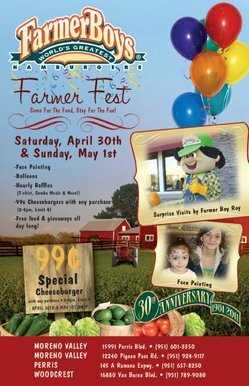 Farmer Boys is celebrating its 30th anniversary with a Farmer Fest Saturday (April 30) and Sunday (May 1) at four Riverside County locations. Moreno Valley: 15991 Perris Blvd. and 12240 Pigeon Pass Road. Woodcrest: 16880 Van Buren Blvd. I was excited to find out a few days ago that La Crperie Caf, the Belmont Shore-based restaurant which was one of my favorites during my stint at the Press-Telegram, opened a location earlier this year in Chino. This week, they’ve been offering a buy-one-get-one-free entre after 8:30 p.m.
I’m planning to make the trek out there to take advantage of the deal. It’s that good. The offer expires Saturday (April 30) expired yesterday. However, there are conflicting dates on the coupon. Click here for the coupon. You can still get a free dessert with entre purchase today (April 29) or tomorrow (April 30). Click here for that coupon. 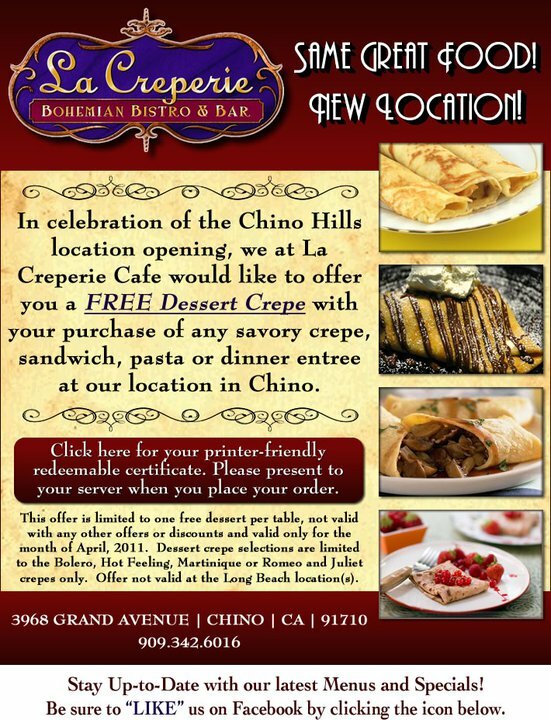 The Chino location of La Crperie Caf is at 3968 Grand Ave. The promoters of the Inland Empire Food Truck Fest at the Citizens Business Bank Arena in Ontario have begun to name names. They’ve announced the first few trucks in the lineup via Twitter and Facebook today. First up is the White Rabbit Truck, which I was able to sample during last month’s Sunday Social at My Delight Cupcakery. They’ve also announced the Morsels Baking Company Bakerytruck, The Greasy Wiener and Crepes Bonaparte. Good lineup so far…can’t wait for more updates! The Inland Empire Food Truck Fest will take place from 11 a.m. to 6 p.m. June 18. Tickets (including a limited number of early-entry VIP tickets) are available now at the arena box office and at Ticketmaster. Update: The announcements continue. They added Vizzi Truck and a not-yet-launched SlapFish to the lineup on Thursday (April 28) and the Nom Nom Truck and the Boba Truck today (April 29). The Norco Bob’s Big Boy will be hosting a “Hope for Japan” fundraiser from 4 to 9 p.m. Tuesday night (May 3). The restaurant will be donating 10% of their sales during those hours to the American Red Cross for their Japan earthquake and Pacific tsunami relief efforts. The Norco Bob’s Big Boy is at 3521 Hamner Ave.
After a delicious Italian meal at Redlands’ Isabella’s Ristorante, the Dine 909 crew decided to swing by the newly-opened Five Guys Burgers and Fries to see if the line was out the door. Well, it was busy, but no huge line. Then we decided to swing by Canton Bistro, which is in the same shopping center. The Asian fusion restaurant had, in the past few months, gone from serving lunch and dinner to just serving dinner to just being open as a nightclub. Well, its fortunes have fallen further still. We found a red “illegal to enter” sign posted on the inside of the front doors. In this recession, restaurants seem to be having a particularly hard time, but I’m sure it didn’t help that another Asian restaurant opened its doors just across the parking lot last year. After hitting the Riverside location last week, today’s Tommy Tuesday lands once again in the Inland Empire. Today’s event is at the Corona restaurant, 2280 Compton Ave.
Tommy Tuesday is a celebration of the Original Tommy’s 65th anniversary, bringing the price of its signature chiliburger down to 65. All you have to do is say the secret word “Tradition” to get up to five chiliburgers at that price. The deal is good until 10 p.m. tonight (April 26). For more information, click here to visit the Facebook page for the event. Chili’s Grill & Bar is hosting a fundraiser for San Francisco Giants fan Bryan Stow, who remains in a medically-induced coma at County-USC Medical Center after being brutally beaten following the Dodgers’ Opening Day game. The restaurant will donate 15% of your bill to the family when you present this flier anytime tomorrow (April 27). This is the second fundraiser Chili’s has done for Bryan’s family. The initial “Give Back” event, with only Northern California locations participating, netted $22,923 towards his medical expenses. This fundraiser will take place statewide. Chili’s can be found throughout the Inland Empire, including San Bernardino, Rancho Cucamonga, Redlands, Fontana, Chino Hills, Montclair, Beaumont, Victorville, Barstow, Riverside, Moreno Valley, Corona, Lake Elsinore, Hemet, Murrieta and Temecula. In Monday’s Sun and Daily Bulletin, we got an update on both Supervisor Janice Rutherford’s continuing efforts to allow food trucks to roam the county and the food truck festival scheduled for June 18 at Ontario’s Citizens Business Bank Area. First up is Neil Nisperos’ story on Rutherford and her efforts to repeal the ban on the mobile eateries. It mentions My Delight Cupcakery’s specially-permitted monthly events, which feature food trucks brought in from Los Angeles and Orange counties. My Delight has plans for their own truck. You can read Neil’s story here.